Chapter 6: Borders - How do you become a successful beggar in Sweden? The humiliation was so great that if I’d lingered I would have been completely subsumed, but I grew a shell, at times it protects me, at times it hinders me. I know that voids can’t exist without borders. Borders demarcate spaces. As most people, I have set up limits around my inner self. Without these limits I’m vulnerable. In The Fragility of Goodness, American philosopher Martha Nussbaum writes: “Human cognitive limits circumscribe and limit ethical knowledge and discourse; and an important topic ‘within’ ethical discourse must be the determination of an appropriate human attitude towards those limits.”1)Martha C. Nussbaum, The Fragility of Goodness. Luck and Ethics in Greek Tragedy and Philosophy, (New York: Cambridge University Press, 1986), 8. In my first encounter with the begging man I didn’t begin by parsing what I didn’t understand, there was no desire to know more – that came later. Everything about giving and begging stands between us. I want to reveal the spaces between people. But what if there is no space? What if there’s a chasm, or a wall? Do I need to transcend that first? How? BORDER is a two-minute animation with a text by Mara Lee.2) BORDER (animated film, 2:10 min). “She who’s never trembled when she’s passed a border doesn’t know what it is to be human,” writes Mara Lee.3)Mara Lee, “… sa hon och darrade”, Glänta No. 2 (2011). This sentence moves me deeply. In earlier works I’ve documented the Israeli wall on the border with the West Bank.4)Cecilia Parsberg, “The Wall”, ceciliaparsberg.se/thewall/. Back then, in the spring of 2002 I started to draw two people, one on each side of a wall, people who begin to vibrate, eventually the wall cracks, is pulverized, and rebuilt, cracks to powder and is rebuilt – it’s a loop. It’s about two people who vibrate out of desire, they get to know each other, the wall comes down, but in the negotiations of desire the need to differentiate, to set limits, grows and so the situation becomes polarized and a new wall is built. The animation is also about the space between us as the place where the negotiation, the precursor to contact happens. One becomes vulnerable in that negotiation of limits. I finished this animation in 2013 and it turned out to also be about the distance between me and the person begging, a distance demarcated by a number of ethical quandaries. When I tremble before the unknown I tremble before the change that could befall me. To activate the crossing of the border, movements must be performed contrary to accustomed patterns of identification, new patterns of movement must be generated, a new choreography. Marcia Sá Calvacante Shuback says: “The word dance originates from trembling or quivering.”5)Calvacante gave a lecture at Weaving Politics, which was a research seminar at Dansens Hus in Stockholm, arranged by Christina Caprioli, December 14–16, 2012. A gestalt therapist discovered that my left eye wasn’t active at all, so I was given exercises to perform daily. In the beginning the exercises would make me tremble, as if I was freezing. It was embarrassing, I’d be speaking with someone at work I would at times need to excuse myself or go to the bathroom until I’d stopped shaking. Over time I trained my left eye to see actively. “We are losers, and you have to learn from us,” says Kefah, a poet living in the Israeli-occupied territories on the West Bank. To occupy is a method of besetting a space, an area, the property of another. Israel has built its wall to demarcate occupied territory, and to control and prevent movement between the occupied and the inhabitants of Israel proper. The wall is Israel drawing its limit, Israeli law. In 2006 the International Tribunal in The Hague decreed the wall to be in violation of international law. Many Israelis see the wall as protection against what they fear might happen if it wasn’t there. The wall is physical as well as mental. It originated as an idea, it was visualized, sketched, planned, and then projected and built. The wall is the outcome of decisions based on experience. Despite the decree of The Hague Tribunal it would appear that an international moral code supports the wall, by virtue of not actively trying to repeal it, it also condones the occupation. When Palestinian Kefah says: “We are losers, and you have to learn from us” he is suggesting a less common way of looking at the relating and teaching of them or that which can’t be excluded and controlled. He’s a poet, a poet under occupation. His view of the wall is that it prevents possibilities to relate and thus build communities. He maintains that the wall is a break in a movement, that this demarcation is a law that fractures the development of community. When I visit Kefah he teaches me: To only relate against, means obliterating one’s own agency in a dependency, to let oneself be occupied. He teaches me to relate to, be close, on the side of, around, by, and turn values around, to see spaces around that which is visible. It’s about autonomy and stance. Dignity, to give worth, to receive worth, worth cannot be taken. Like when women in my home country demanded the right to vote, to be seen, heard, and spoken to, to receive a response from society, an acknowledgement that one exists, to receive worth. They demanded that images of women change. Women were the occupied territory of prevailing knowledge. Counting women’s knowledge as knowledge was a struggle against subordination that was fought by attending to one’s worth. That struggle was just as much about attending to the knowledge that is considered worth promoting. There are days when I can’t see my face in the mirror (my self portrait looks like an oxidized and shaken charcoal drawing, the sharp features are nearly erased)6)Or does my face look like the portraits artist Carl Erik Hammarén painted in the late 1970s and early 1980s? Or like the work of Lena Cronqvist where she portrays herself as a child and as memories of her childhood in painting after painting, or possibly like Frida Kahlo whose self-portraits express various frames of mind? in part because I can’t grasp how others see me, in part because I can no longer act the way I always have. My limits and contours have been moved and must be redrawn. It is a phase of confusion, an uncertainty that lasts until a new position can be invented. In Frames of War Judith Butler writes that what may finally be true of us is that: “The subject that I am is bound to the subject I am not, that we each have the power to destroy and to be destroyed, and that we are bound to one another in this power and this precariousness. In this sense, we are all precarious lives.”7)Judith Butler, Frames of War: When is Life Grievable? (New York: Verso, 2009), 43. It is only in the encounter with others that my contours can be redrawn and I can become aware of which limits I need and which I don’t. And I know that I don’t want to become hardened, die with a hard body that only softens in the flesh, I want to be receptive. My work can be seen as a preparation for such encounters, mine and others. 6.2 Mind the Gap Between Begging and Giving! Your body on the street is in my way. You are in my way! I’m used to walking here. Go away, you bother me! I don’t want to bend, and even if I do I’m resistant – are you making it hard for me to bend, did you get into my muscles? Are you the obstacle? What “prevents” me from you? Are you a sham? Are you a lie? I’ve paid my taxes. I’m honest. I don’t understand – I don’t know the way you sit, you sit like one who’s subservient and I’m not. Just to my boss, but I don’t beg. Ah, I understand, you don’t know what I know. Or are you deceiving me? Perhaps you’re part of a mafia and have more power than I could ever imagine? Perhaps you’re really the one with the power, are you manipulating me? I sense something at work here that I can’t see. Why are you kneeling? Are you kneeling before me? Why? Why do you accept it? Why don’t you protest? Are you letting someone push you down? What force? Why should I participate in this, I don’t see anyone here who’s responsible. Get up! Why are you putting me in this position, it’s irritating. Is this free movement? If so freedom is a lie by those who decreed this movement. I can’t stand it, what keeps me together? It’s violent. Where can I complain? What should I protest? Structural inequalities have to do with our images and attitudes; these “images”, collective as well as individual, visual as well as verbal – are at play in society. This is how the political is connected to the aesthetic. Reluctance, or desire to include, generates images, ideas of one another. The billboards spread an image of begging as criminal. Within the body politic the law is intended to stop activities that are considered illegal. Within the framework of current policy business in the form of organized entrepreneurship is seen as fruitful and desirable. But once the word “stop” is placed in front of “organized” begging becomes something threatening, something that one must distance oneself from. The benevolent giver feels they are being conned, a menacing organization is behind the begging we see on the streets. 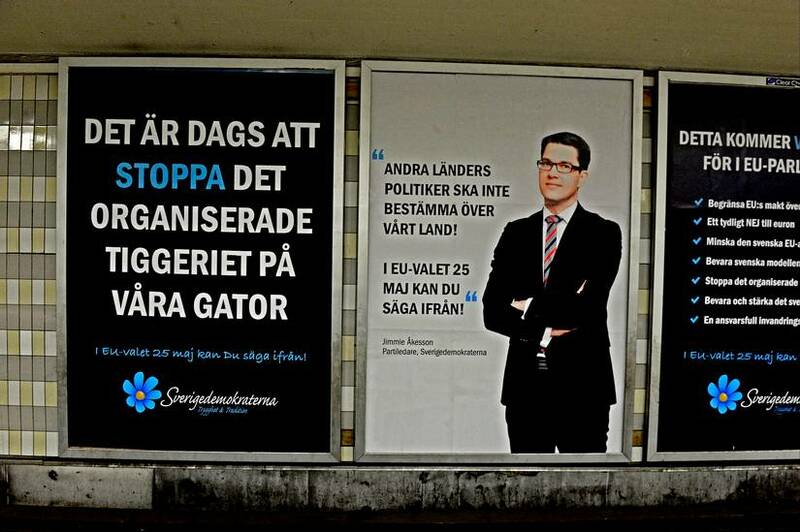 The Sweden Democrats (SD) appear to be the defender of justice that has come to save the citizens. How to negotiate this gap? I have so many images that prevent me from seeing you as human. I may see you as one of the Roma and then I must try to understand the problem of ethnicity. Or I may see you as a migrant who must be integrated into Swedish structures and then I must try to understand migration policy. Mind the gap between begging and giving people! Between begging and giving! Slussen, Stockholm July 2014. Photo: P-O Sännås. “According to the aid group the Roma were given money when they returned home before Christmas, the money was intended to last them so that they could be home with their children over the winter. But within weeks the Roma were back on the streets of Gnosjö, […] According to Mats Johansson they feel entitled to the money that the aid group has collected with the intention of launching aid work in Romania. He says that the beggars have demanded one hundred thousand kronor from the aid group. […] ‘We get that they don’t think the way we do. They are suspicious in ways we could never have imagined. – Expectations and cultures have clashed. But there are so many other things that have happened in the longer-term perspective on site in their village and their municipality that would never have come to be if we hadn’t met these friends. They’ve become ambassadors and eye-openers to us. […] We must ask the question; what do we want our aid to do?’”9)Kristin Renulf, “Konflikt när tiggarna återvände till Gnosjö”, SVT Nyheter, February 12, 2016. Accessed April 27, 2016, www.svt.se/nyheter/lokalt/smaland/konflikt-nar-tiggare-atervande-till-gnosjo. The problem doesn’t seem to be just begging, but giving too, or is it the interaction itself? SD wants to solve the problem by prohibiting begging. The citizens of Gnosjö want to solve it through work and education. The latter appear to want to continue investigating the problem. They’re going to continue the process and state purposes to their giving. They create a space to act together with the begging people who need to beg due to various reasons pertaining to time, situation, and causes, resulting in an interaction through giving. But negotiation is necessary to create agency. Värnamo Nyheter, a local paper, reports on a letter sent by Mats Johansson to all the participants in Gnosjö where he relates that some of the people who beg have expressed the view that the citizens of Gnosjö have prevented them from begging. “Among other things he writes: ‘This had to do with various demands for more money, disappointment, anger, and expressions such as the help they’ve been given not being help at all because they’d had to work’.”10)Emilia Lindholm, “Brev om tiggare väcker känslor”, Värnamo Nyheter, February 18, 2015. Accessed April 27, 2016. www.varnamonyheter.se/artikel/125248/brev-om-tiggare-vacker-reaktioner. These are opinions expressed by a few – not all – of those who beg, but it can be seen as an example of an encounter between different value systems. Negotiating two value systems isn’t easy, especially not when money is involved and there is a power imbalance between the negotiating parties. If begging has been the only source of sustenance for the poor person it would be reasonable to see it as a safe, or at least an accustomed way of making a living. For the citizens of Gonsjö the same thing connotes a precarious existence. Images of safety and the lack thereof are rarely mutual.11)Social capital can work differently in both communities. Social capital can be understood as “community spirit in the form of intrahuman bonds created and maintained by civil society”. When these community cultures meet misunderstandings arise. They have different images of begging and giving. Glenn Svedin, En ohyra på sammhällskroppen, (Höör: Brutus Östlings Bokförlag Symposion, 2015). Accessed April 27, 2016, http://miun.diva-portal.org/smash/get/diva2:812217/FULLTEXT02.pdf. There is a form of control inherent to how the aid is organized and it is paradoxical that the aid sets the terms and in the worst case institutionalizes (affirms) a hierarchy of power, in which the person who is aided is victimized and subordinated. Of course there is also aid in which the organization and entrepreneurship of the poor set the terms for what type of aid is needed. The question for me, in this project, is how the artist’s – my – framing can be challenged when I aim to make visible the situation of giving and begging. I receive an email from Kultur i Väst [Culture in Western Sweden] and experiment with swapping in the words artist and cultural worker for poor. I also swap in art for survival practice. I want to test my own images by changing a rhetorical context (in a way that is similar to how Ioana Cojocariu tests how values are tied to a prostrate position by changing the context from the street to a yoga studio). What’s regarded as creative and groundbreaking in one context is a method of survival in another. Poor people coming together, joining forces and cooperating isn’t new. But around Europe and in Sweden people are beginning to speak of self-organizing as a vital force and an important part. So this fall we at Kultur i Väst initiated the work of investigating if there’s any interest in starting and operating a cluster for self-organization among the independent practitioners in the region. What is it and could such a cluster play a role in our region? What is a cluster for self-organization and is it needed? The small-scale self-organized activities often represent the first step in the ecosystem of the poor through fast hybrid methods of working and informal networks. They also bring contemporary professional survival practice to smaller communities where no other contemporary survival practice exists, through deep and participant-based interest in the site. In this way they contribute to both the development of survival practice and to social debates outside large urban areas. The symposium raises questions about autonomy, commons, and the relationship between self-organizing and the survival practice. The goal is that by focusing on the worth and networking potential of the self-organized one might create a context for inspiration, tools, and opportunities for exchange of experience and knowledge for others than those directly involved.”12)The original reads (italicized bold letters were swapped out): “Artists and cultural workers coming together, joining forces and cooperating isn’t new. But around Europe and in Sweden people are beginning to speak of self-organizing as a vital force and an important part. So this fall we at Kultur i Väst initiated the work of investigating if there’s any interest in starting and operating a cluster for self-organization among the free practitioners in the region. What is it and could such a cluster play a role in our region? What is a cluster for self-organization and is it needed? The small-scale self-organized art activities often represent the first step in the ecosystem of art through fast hybrid methods of working and informal networks. ——They also bring contemporary professional art to smaller communities where no other contemporary art exists, through participant-based and deep interest in the site. In this way they contribute to both the development of art and to social debates outside large urban areas. The Romani mayor of Gradinari says: “Nobody’s ever asked the Roma what they want, not during the Ceausescu regime in Romania, not after Ceausescu, and not in Sweden. The assumption is always that Roma do what others have planned for them. They are a problem to be solved.”15)Karin Petterson and Anders Lindberg, “Ledare: På plats i Rumänien”, Aftonbladet. Accessed April 27, 2016, www.story.aftonbladet.se/rumanien. The political question is how aid to those in need can be anchored in their life, in a reality that may seem different and nearly impossible to understand. How are they supposed to speak to each other, listen and create discretion? Or put another way: How can images be made of events, how can images be made with others? To see images is an act; the images in circulation must be constantly renegotiated and that can’t happen if new images aren’t produced. Mind the gap between begging and giving people? Between begging and begging? Between giving and giving! That I am an agent, but also a plant; that much that I did not make goes towards making me whatever I shall be praised or blamed for being; that I must constantly choose among competing and apparently incommensurable goods and that circumstances may force me to a position in which I can’t help being false to something or doing something wrong; that an event that simply happens to me may, without my consent, alter my life; that it is equally problematic to entrust one’s good friends, lovers, or country and to try to have a good life without them – all these I take to be just the material of tragedy, but everyday facts of lived practical reason. (Martha Nussbaum)16)Martha C. Nussbaum, The Fragility of Goodness. Luck and Ethics in Greek Tragedy and Philosophy, (“Aeschylus and practical conflict”), (New York: Cambridge University Press, 1986), 5. I subordinate myself to the tragedy, get on my knees before what’s happening and can’t be controlled, it’s a seemingly passive physical act, a form of contemplation to gather strength. My mother was 63 years old when she was diagnosed with Alzheimer’s disease. She understood what it would mean – simply put she would lose all the abilities that you acquire early in life and she would become dependent on medicine. The important thing was that she had a context, she had us. She died fifteen years later. Over these fifteen years I felt resistance each time I went to visit her and was scared, not of visiting her in the environment that seems to be the final one of life – routines, diaper changes, fruit soup, the smell of urine, other unreachable old people who smelled bad and cried out for help in their dementia – but because I knew she’d have deteriorated more each time. At each visit I wrote down what happened; she was eaten up from the inside, physically and mentally, the moments in which she was able to be present kept getting shorter. But every time I was on my way to her I decided, actively, to see what I did get and not what I didn’t get. That helped me conquer my fear. And she fought. When her ability to discern shapes disappeared she saw the color green rather than a tree. When she lost her ability to discern color – one by one, the last color she saw was red – she still enjoyed the familiar taste of strawberries. When speech disappeared she sang, when words disappeared she made noises, when she couldn’t dance anymore, she twitched, she wanted to communicate! even if she couldn’t reach us. It could take her hours to break out of “her world”. But eventually we’d make contact. It happened in various ways. Once when she came walking down the hallway she didn’t recognize me; I hugged her and said my name, which she didn’t recognize either, but then she inhaled my scent17)Maria Larsson, professor of psychology at the University of Stockholm says that the sense of smell is the oldest of our five senses. Among other things it helps us feel safe. She has studied the connection between scent, memory, and feelings. The feelings aroused by a scent memory are more powerful than sight and sound memories, especially from childhood. and a yeees emerged from far inside her body. That was a great moment, it didn’t matter that she no longer knew my name, that she couldn’t remember our shared history. The moments of contact became increasingly brief and the space between them kept getting longer, but when they happened it was infinitely meaningful. Contact is something that happens, something that is received and taken. It can be heard and felt. If there is trust. And will. It can’t be described. Swedish translator Joachim Retzlaff’s prologue to Hannah Arendt’s The Human Condition reads: “Language characterizes the human as a social being. Because use of language assumes mutual understanding, that is to say a minimum of intersubjectivity.”18)Hannah Arendt, Människans Villkor, transl. Joachim Retzlaff, (Gothenburh: Daidalos, 1998), 17. When my mother lost the ability to communicate, she died. Many times and in many places I’ve experienced that it’s possible to make contact despite different languages; a sort of resonant space has emerged between us. We belong to the same tribe, said Palestinian poet Kefah Fanni in a conversation about why it’s sometimes possible to communicate on a level that seems to be beyond words, that rejects national borders and cultural differences.19)Caribbean poet and cultural theorist Édouard Glissant expresses it in a similar way: “To the contrary the commons of which I speak relate to an intuition that can be experienced everywhere, it is spread across the surface and belongs to that in the world that doesn’t let itself be explored and the endless conditions that creates, a ‘universally’ acknowledged and spread but very particularly experienced intuition, which spreads and emerges in all places, and mainly resembles the poetics of difference. A poetics that trusts the never ending expressions of intuition and ability to get closer to other intuitions, closer to the relation, closer to the difference, which shares its life forces.” Translated from the Swedish: Édouard Glissant, Relationens filosofi. Omfångets poesi, (Gothenburg: Glänta 2012,) 35. If we want it, he added. Love comes with its own delimitations. And that is what I investigate in this thesis, perhaps that’s all I want and long for, humanity, contact. The rest is a failure of realizing capability as function. ——Martha C. Nussbaum Creating Capabilities. The Human Development Approach, (New York: The Belknap Press of Harvard University Press, 2011), 25. “Functions are beings and doings that are the outgrowths of realizations of capabilities.”21)Ibid., 25. One could say that in a society where people are involved in functions the function is the final goal of the capability. “But capabilities have value in and of themselves, as spheres of freedom and choice.”22)“In one standard formulation by Sen, ‘a person’s capability’ refers to the alternative combinations of functionings that are feasible for her to achieve. Capability is thus a kind of freedom: the substantive freedom to achieve alternative functioning combinations.’ In other words, they are not just abilities residing inside a person but also the freedoms or opportunities created by a combination of personal abilities and the political, social and economic environment.” Ibid., 21. Many years ago I saw a light installation by the composer Alvin Lucier who used a number of instruments and recording equipment to show how we create vibrations in the air, sound waves, by moving in relation to one another. In this way we move in a resonance box, indoors as well as in the social space, and despite the matrix and structural delimitations we can reason or resonate with one another. A friend expressed it like this: “Philosophy is slow in comparison to visual art, which is slow in comparison to music. Sound travels the fastest.” Can sound actually be faster than light at times? When I’m not there, in the resonant space, when I fail to be in the resonance, it’s a question of life support, a just about, an adding and subtracting to make sense. I’m not entirely aware of when I enter and leave these spaces, but when I am there I have clear thoughts – I sense, know – a tone sounds right though the meanings. When the tone is received it happens – contact. “Resonance sets into motion and sustains all creative processes. […] The inhaling and exhaling is the work of rhythm, or of Breath, manifested as voice, sound, word – whether audible or silent, spoken or written, outside or within.” writes Trinh T. Minh-ha.23)Trinh T. Minh-ha, Elsewhere, Within Here: Immigration, Refugeeism and the Boundary Event, (New York: Routledge, 2011), 57. I can’t see voids, I can see the borders, I can’t depict voids, I can depict borders. I can see traces and spaces. And I can hear voices – I listen to voices that want to be heard across borders. I think about what Martha Nussbaum wrote: that capabilities and freedom of choice are connected.24)Nussbaum, Creating Capabilities, 20. ——In her book Martha Nussbaum proposes a model of capability that would: “insist that the political goal for all human beings in a nation ought to be the same: all should get above a certain threshold level of combined capability, in the sense not of coerced functioning but of substantial freedom to choose and act.” By highlighting certain capabilities in a choreography – in a trusting environment – the function could be made visible that is a precondition for other functions to change: communication. I start planning a film installation with a chorus of beggars standing opposite a chorus of givers; initially I call it Voices across Borders. 1. ☝︎ Martha C. Nussbaum, The Fragility of Goodness. Luck and Ethics in Greek Tragedy and Philosophy, (New York: Cambridge University Press, 1986), 8. 2. ☝︎ BORDER (animated film, 2:10 min). 3. ☝︎ Mara Lee, “… sa hon och darrade”, Glänta No. 2 (2011). 4. ☝︎ Cecilia Parsberg, “The Wall”, ceciliaparsberg.se/thewall/. 5. ☝︎ Calvacante gave a lecture at Weaving Politics, which was a research seminar at Dansens Hus in Stockholm, arranged by Christina Caprioli, December 14–16, 2012. 6. ☝︎ Or does my face look like the portraits artist Carl Erik Hammarén painted in the late 1970s and early 1980s? Or like the work of Lena Cronqvist where she portrays herself as a child and as memories of her childhood in painting after painting, or possibly like Frida Kahlo whose self-portraits express various frames of mind? 7. ☝︎ Judith Butler, Frames of War: When is Life Grievable? (New York: Verso, 2009), 43. 8. ☝︎ Fredrik Tideman, “Gnosjö sluter upp för att ge tiggarna en bättre tillvaro”, Metro, September 26, 2014. 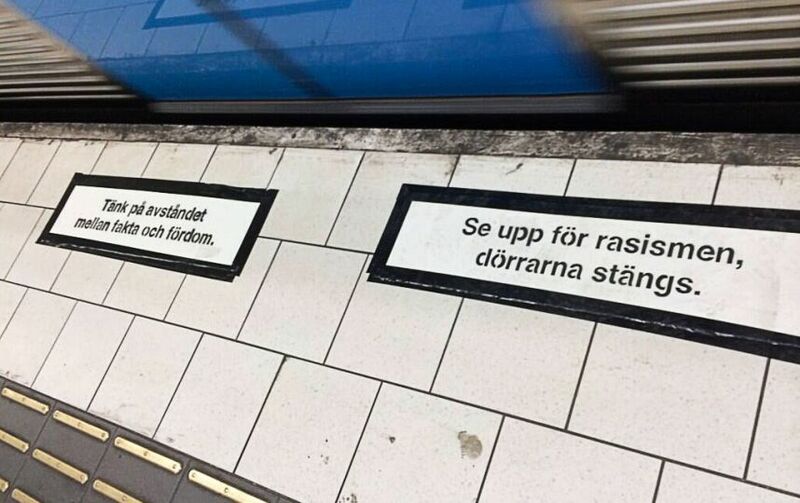 Accessed April 27, 2016, http://www.metro.se/nyheter/gnosjo-sluter-upp-for-att-ge-tiggarna-en-battre-tillvaro/EVHniz!nkJj81V1zs5Y/. 9. ☝︎ Kristin Renulf, “Konflikt när tiggarna återvände till Gnosjö”, SVT Nyheter, February 12, 2016. Accessed April 27, 2016, www.svt.se/nyheter/lokalt/smaland/konflikt-nar-tiggare-atervande-till-gnosjo. 10. ☝︎ Emilia Lindholm, “Brev om tiggare väcker känslor”, Värnamo Nyheter, February 18, 2015. Accessed April 27, 2016. www.varnamonyheter.se/artikel/125248/brev-om-tiggare-vacker-reaktioner. 11. ☝︎ Social capital can work differently in both communities. Social capital can be understood as “community spirit in the form of intrahuman bonds created and maintained by civil society”. When these community cultures meet misunderstandings arise. They have different images of begging and giving. Glenn Svedin, En ohyra på sammhällskroppen, (Höör: Brutus Östlings Bokförlag Symposion, 2015). Accessed April 27, 2016, http://miun.diva-portal.org/smash/get/diva2:812217/FULLTEXT02.pdf. 12. ☝︎ The original reads (italicized bold letters were swapped out): “Artists and cultural workers coming together, joining forces and cooperating isn’t new. But around Europe and in Sweden people are beginning to speak of self-organizing as a vital force and an important part. So this fall we at Kultur i Väst initiated the work of investigating if there’s any interest in starting and operating a cluster for self-organization among the free practitioners in the region. What is it and could such a cluster play a role in our region? What is a cluster for self-organization and is it needed? The small-scale self-organized art activities often represent the first step in the ecosystem of art through fast hybrid methods of working and informal networks. 13. ☝︎ “The overarching goal for FEAD is that persons in a socially vulnerable position will have increased social participation and autonomy. More specifically this primarily concerns EU and EEA citizens that are in Sweden for shorter periods of time.” FEAD, “Nationell utlysning: Fead-insatser 2015–2018”, (Dnr 2015/00364), April 30, 2015. Accessed May 10, 2016, www.esf.se/Documents/Våra%20program/FEAD/Utlysning/Utlysning%20Fead%202015.pdf. 15. ☝︎ Karin Petterson and Anders Lindberg, “Ledare: På plats i Rumänien”, Aftonbladet. Accessed April 27, 2016, www.story.aftonbladet.se/rumanien. 16. ☝︎ Martha C. Nussbaum, The Fragility of Goodness. Luck and Ethics in Greek Tragedy and Philosophy, (“Aeschylus and practical conflict”), (New York: Cambridge University Press, 1986), 5. 17. ☝︎ Maria Larsson, professor of psychology at the University of Stockholm says that the sense of smell is the oldest of our five senses. Among other things it helps us feel safe. She has studied the connection between scent, memory, and feelings. The feelings aroused by a scent memory are more powerful than sight and sound memories, especially from childhood. 18. ☝︎ Hannah Arendt, Människans Villkor, transl. Joachim Retzlaff, (Gothenburh: Daidalos, 1998), 17. 19. ☝︎ Caribbean poet and cultural theorist Édouard Glissant expresses it in a similar way: “To the contrary the commons of which I speak relate to an intuition that can be experienced everywhere, it is spread across the surface and belongs to that in the world that doesn’t let itself be explored and the endless conditions that creates, a ‘universally’ acknowledged and spread but very particularly experienced intuition, which spreads and emerges in all places, and mainly resembles the poetics of difference. A poetics that trusts the never ending expressions of intuition and ability to get closer to other intuitions, closer to the relation, closer to the difference, which shares its life forces.” Translated from the Swedish: Édouard Glissant, Relationens filosofi. Omfångets poesi, (Gothenburg: Glänta 2012,) 35. ——Martha C. Nussbaum Creating Capabilities. The Human Development Approach, (New York: The Belknap Press of Harvard University Press, 2011), 25. 22. ☝︎ “In one standard formulation by Sen, ‘a person’s capability’ refers to the alternative combinations of functionings that are feasible for her to achieve. Capability is thus a kind of freedom: the substantive freedom to achieve alternative functioning combinations.’ In other words, they are not just abilities residing inside a person but also the freedoms or opportunities created by a combination of personal abilities and the political, social and economic environment.” Ibid., 21. 23. ☝︎ Trinh T. Minh-ha, Elsewhere, Within Here: Immigration, Refugeeism and the Boundary Event, (New York: Routledge, 2011), 57. 24. ☝︎ Nussbaum, Creating Capabilities, 20.